Doubting with Thomas: Ruminations on John 20:24-29 | When I Survey . . .
That makes us laugh, but who among us has not been troubled by questions and doubts at some time in our life. 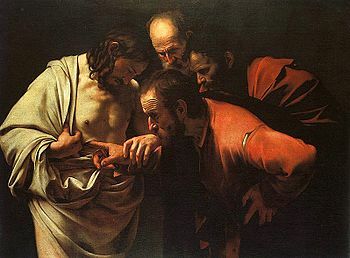 I think that the story of “doubting Thomas” is probably in the Gospel of John because, even in the early generations of the church, faith in the Risen Christ was not an automatic thing. Faith was hard to come by and hard to keep in those days just as it is today. So Thomas is a stand-in for all the doubters then and now. The problem was that Thomas was not present the first time that Jesus came to the disciples, and he won’t accept their claim that Jesus is alive unless he can see him with his own eyes and touch him with his own hands. The disciples had been hiding. They had bolted the door and were listening for the dreaded sound of footsteps on the stair when suddenly Jesus was among them. He stood there in their midst and he told them to breathe in his breath, his holy breath and spirit, so that they could go out into the world again and perform his holy work. Jesus replies to Thomas, “Have you believed because you have seen me? Blessed are those who have not see and yet believe” which refers to every generation since then which cannot see Jesus but relies on the testimony of those like John and Mary Magdalene who did see. And yet often we remain like Thomas. We do need some evidence. Roughly two thousand Easters have taken place since Thomas’s day, two thousand years’ worth of people proclaiming that the tomb was empty and the dead Christ alive among us to heal, sustain and transform. But in one sense it is not enough. If we are to believe in his resurrection in a way that really matters in our lives and in the life of the world, we must have some experience of it. And so it is that when and where people believe in the resurrected One, they have in some sense seen him, or at least known him, sensed him. If we are not to see him and touch him as Thomas did, we still must know him. For now as then, it is not Jesus’s absence from the empty tomb that convinces us, but his presence in the midst of us. Easter is not the celebration of the absence of his body from the tomb, but his living presence with us now. So how do we know him when we can’t see him or touch him? In Luke’s Emmaus story the disciples knew him in the breaking of the bread, and we still know him in the supper he told us to continue in memory of him. And it is not just his memory we know but his real presence. We may know him in the Word while reading the story in the Bible or hearing a sermon. We may know him in moments of prayer, in moments of deep need or dark despair, or in moments of great joy, such as a baptism. We may know him in service with others, in the joys and challenges of living in the church, which is his body. We may know him by a sick bed or in the hour of trial over a life-changing decision. There are many ways to know the risen Christ, but touching the wounds of his body, as Thomas did, is not one of them. So we walk by faith and not by sight. Our faith lives among our doubts. “Doubts,” says Fred Buechner, “are the ants in the pants of faith. They keep it alive and moving.” It is often our doubts that get us thinking and moves our faith to a more mature level. In some real sense we never stop being Thomas the doubter. Life is complex and mysterious, many questions and concerns do not lend themselves toward easy answers. Yet it is precisely there in the complex world where faith must live if it is to be faith at all and not mere wishful thinking. But that is precisely where we still meet the living Christ, in the real events and commonplaces of daily life. An apocryphal gospel that didn’t get into the canon supposedly written by Thomas himself depicts Jesus as saying, “Cleave a piece of wood and I am there. Lift up the stone and you will find me there.” Which is to say there is no place on earth or in our lives too remote or outlandish for the One who came to save us all. So we must again and again look for the risen Jesus in the ordinary day to day events of our lives. And we look for him amid our doubts. Unlike Thomas we do not get to touch him. But we can know him, and in the end we really do walk by faith and not by sight. But our faith in him is not blind faith. Faith is trust, and we generally trust only those whom we have experienced as trustworthy. If we believe that Jesus is alive it is because at some time in our life he has made himself known to us. If we have not touched him, he has touched us, so that we have been able to say, as Thomas did when he touched that wounded side and held those ruined hands, “My Lord and my God.” Amen. This entry was posted in doubt, Doubting Thomas. Bookmark the permalink.